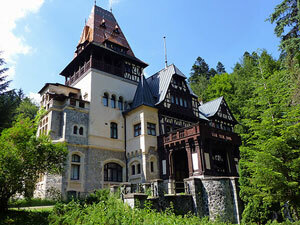 Sinaia is a relatively new settlement, situated 100 km north of Bucharest in the Carpathians. The first construction was Sinaia Monastery in the XVIIth century. A settlement began to develop here, once the Austrians constructed roads along the Prahova Valley, so they could cross the mountains from Transylvania to attack the Ottomans in Wallachia. The inns were established at the same timeas traders’ chariots arrived there and the region became populated. The interest in Sinaia increased during the second half of the XIXth century, after the first king of Romania, Carol I, visited the little mountain village and, charmed by the landscape decided to build a royal residence there. Peles Castle was completed in 1883, after 10 years, and Sinaia found itself growing in popularity as place to spend the summer as a consequence. King Carol I bought the domain from Sinaia from his personal funds. Peles Palace was used as a royal summer residence, and also as a venue for important political events, such as the crown council in 1914 that decided the initial neutrality of Romania in WW 1 TheGreat War. The royal family welcomed important guests at Peles including emperor Franz Josef, who was enchanted by the castle. The exterior of the castle/palace (I consider that the difference between a palace, which is a royal/aristocratic residence and a castle, which is a military residence used mostly for defence, made Peles, a palace not a castle at is called in all the travel guides) is German Neo - Renaissance style, while about 160 rooms are finished in a variety of different styles, including German, Italian and English Renaissance, German Baroque, French Roccocco etc. The Council Room, the Florentine Room, the Moorish Salon, the Armoreys, the Playhouse, the Concert Hall, the Turkish Parlourand others are all sumptuously decorated and are among the most spectacular in the palace. 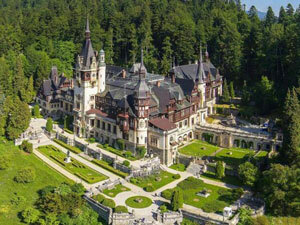 The smaller Pelisor Palace, completed in 1903 as the residence for royal heirs, is situated close to Peles. The communist regime confiscated all the royal properties in 1948 and Peles Palace became a museum 5 years later. However, in the last years of the regime, the whole area was closed to the public and the properties reserved for use by Ceausescu. After 1990 Peles and Pelisor were reopened to visitors.